The Asian Development Bank funds physical infrastructure across the region, but unlocking a country’s growth potential takes more than roads and railways. About 600 people have registered to attend the World Economic Forum on Asean in Phnom Penh next week, according to Transport Minister Sun Chanthol, whose ministry is an organizer of the event. In a scathing attack on independent media in Cambodia which it claimed were abusing their freedoms, the country’s foreign ministry last month claimed that the press was so free that it was able to report false accusations against the government unimpeded. A day after a prominent journalist was slapped with an arrest warrant, government officials pulled out all the stops yesterday to tout what they insisted was Cambodia’s free and unfettered press. International commodity prices for cashew nuts are rapidly increasing due to lower supply from Cambodia and Vietnam which is driving up profits for the Kingdom’s farmers, according to industry stakeholders. Two new life insurance companies will launch operations in Cambodia by the end of this week, aiming to grab hold of a market that has seen rapid expansion in recent years while also creating stronger competition in the emerging industry. Cambodia will request further information on the transboundary impacts of Laos’ proposed Pak Beng hydropower project following an upcoming regional stakeholder meeting on Friday, an official has said. 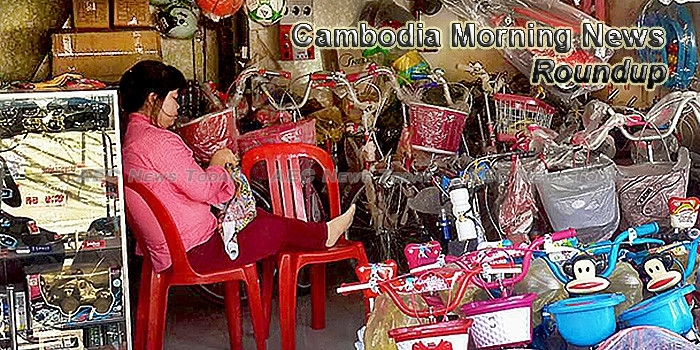 Misconceptions and a lack of regulation for corporate social responsibility (CSR) in Cambodia are the main challenges facing ethical business practices in the country, an expert has said. Cambodia is ready to host the World Economic Forum on ASEAN, which is scheduled from May 10 to May 12 in Phnom Penh, government officials said Wednesday. Metawater will provide its power-saving inverter technology to a water treatment plant in Cambodia’s capital through an arrangement that will help the Japanese government earn carbon reduction credits. A Cambodian Ministry of Interior official today confirmed that the CNRP most recent set of amendments to its bylaws had been officially accepted, freeing up the party to reinstate three deputy presidents whose status had been challenged, and seemingly bringing an end to what had become a weeks-long bureaucratic obstacle course. Senior opposition lawmaker Son Chhay has called for a review of government spending on the Apsara Authority, the body that overseas the Angkor Archaeological Park. Coinciding with World Press Freedom Day, members of the media and government officials gathered in Phnom Penh on Wednesday to honor journalists slain during the 1970s civil war, with the Information Ministry announcing plans to build a press museum. After repeatedly rejecting the opposition CNRP’s amended bylaws for the past two months, the Interior Ministry on Wednesday finally accepted the changes, though it has yet to sign off on the party’s new vice presidents. Families classified as being part of the urban poor could be granted land titles giving them the “legal right” to remain where they’re currently living if they pass an assessment by City Hall, a government official said on Wednesday. In 2012 the Cornell physics professor and documentarian Robert H. Lieberman directed “They Call It Myanmar,” an impressive portrait of that country as it struggled to emerge from military rule. A British man has been arrested in Cambodia on suspicion of abusing young girls. In a video statement, police named him as 68-year-old Clive Cressy, believed to be from Hove in East Sussex. Cashew nut prices have hit the roof and seem to be on a sustained rally due to a crop shortfall in Vietnam.